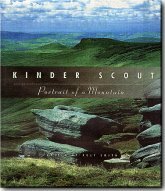 > "Kinder Scout : Portrait of a Mountain"
This review is by Julie Bunting, and was published originally in The Peak Advertiser, the Peak District's local free newspaper, on 1st July 2002, and is reproduced with Julie's kind permission. What a year this is turning out to be for books deserving of high praise. Now comes Kinder Scout, Portrait of a Mountain, a stunning publication from Derbyshire County Council Libraries & Heritage Department in partnership with the National Trust and the Peak District National Park. The book is edited by Roly Smith, president of the Outdoor Writers' Guild. He also comes in with the introduction in his familiar spot-on style and straight from the heart. Of his first encounter with Kinder Scout he recalls: 'What a sight met our unbelieving eyes! We had never seen anything like this before ... we felt we were on top of the world ...'. An emotion he shares with vast numbers of people, for the area attracts around one million visitors a year. Some of Britain's top outdoor photographers have contributed to the book, resulting in a glorious tribute to the highest point in the Peak District by means of a hundred colour photographs. Experts on subjects from geology and natural history to fell running have provided the text. We also learn that there are those who regard Kinder as a sacred mountain, in fact a storehouse for cosmic forces, while legend tells how the gift of long life can be discovered at one particular spot. And did you realise that the Kinder plateau shares its latitude with Siberia and Labrador? The winter-time photographs are a particular joy - the vast majority of us will never see these scenes for ourselves. There is even a map showing routes to the hard-to-find 2,088ft (636m) summit. If this book doesn't make you want to set foot on Kinder for yourself, nothing will. But however many times you go, you will never see the mountain in all the many moods gathered together inside the covers of this truly beautiful book. With 144 pages, Kinder Scout, Portrait of a Mountain, The National Trust will receive 50p from the sale of each book towards the upkeep of Kinder.